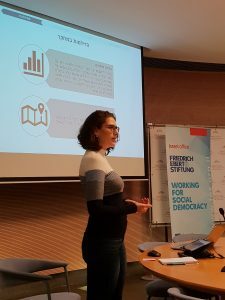 On Friday, 05.04.2019, approximately 30 course participants of “Progressive Economists” presented their project results to their fellow students, mentors and experts from the socio-economic field in short presentations. 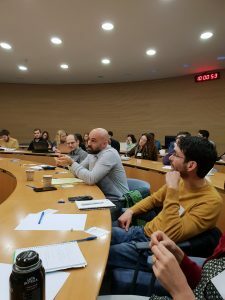 The course “Progressive Economists” is organized by the Social Economic Academy in cooperation with the Berl Katznelson Foundation and the Friedrich-Ebert-Stiftung Israel and enables students from Tel Aviv University and Hebrew University to implement socio-economic projects in cooperation with institutions of the public sector. In addition to the Ministry of Economy, partners include the Ministry of Justice, the Ministry of Health, the Ministry of Education and the Ministry of Communications. This year, the students presented, among other things, a study that demonstrates the economic benefits of including people with disabilities into the labor market. 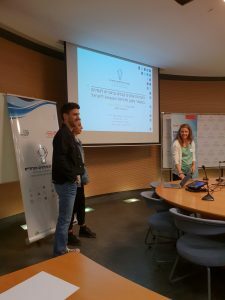 Other working groups had for example investigated how efficiently the emergency services in Israel work or analysed network coverage and the expansion of Internet connections in the country. Following the project presentations, the results were discussed and suggestions for improvement were made. We are very pleased about the great commitment of this year’s participants and wish all of them a successful completion of their projects.